Alaea Sea Salt is a traditional Hawaiian table salt used to season and preserve. 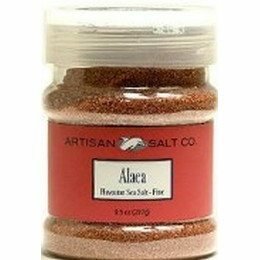 A natural mineral called "Alaea" (volcanic baked red clay) is added to enrich the salt with iron oxide. This natural additive is what gives the salt its distinctive pink color. The clay imparts a subtle flavor that is said to be mellower than regular sea salt. Uses: It is the traditional and authentic seasoning for native Hawaiian dishes such as Kalua Pig, Poke and Hawaiian Jerky. Also good on prime rib and pork loin.